Please no pets, because on the farm are also dogs and cats. The farm was lovely and a really peaceful couple of days away from everything. The house is well equipped and comfortable and Peter and Maria were extremely welcoming, giving us fresh tomatoes, figs and grapes from the farm and offering various other fresh veg also from the farm. There are loads of things to do in and around the area - we especially loved the swimming lakes nearby where we relaxed and swam almost daily. The local villages are great to explore around and it’s close enough to do a day trip to the Douro Valley. But the main draw for us was being off the grid and in nature (although the WiFi helped us stay connected.) It is truly a peaceful and restorative place to take a break. Quinta do Mineiro is a lovely farmhouse set in a small organic quinta with vineyards, sheep and some vegetable and maize crops. It is surrounded by wildflower meadows and woodland growing between the granite slabs and boulders that have often been stacked by the effects of a distant ice age. Peter and Maria are lovely hosts. They made us feel at home on arrival and offered us delicious honey from local bees and plenty of advice on places to visit, but were happy to respect our privacy for our idyllic stay. We stayed as a couple for a week, but there would be plenty of space for a family of four with a shaded bar-be-cue area and enormous first floor verandah for just chilling out. The huge kitchen is really well equipped for taking advantage of local produce and Peter offered us a wide selection of herbs from the garden. There are several local places of interest such as the town of Trancoso with its Friday market and even the heart of the Estralla mountains is only a short drive. One excursion I would recommend is up to Pinhao on the River Douro where the port grapes are grown. You can go on boat cruises, vineyard tours or just take in the most breath taking scenery. Overall the sheer tranquillity of our stay at Quinta do Mineiro left us feeling completely relaxed and free of stress. This is a perfect place to stay. 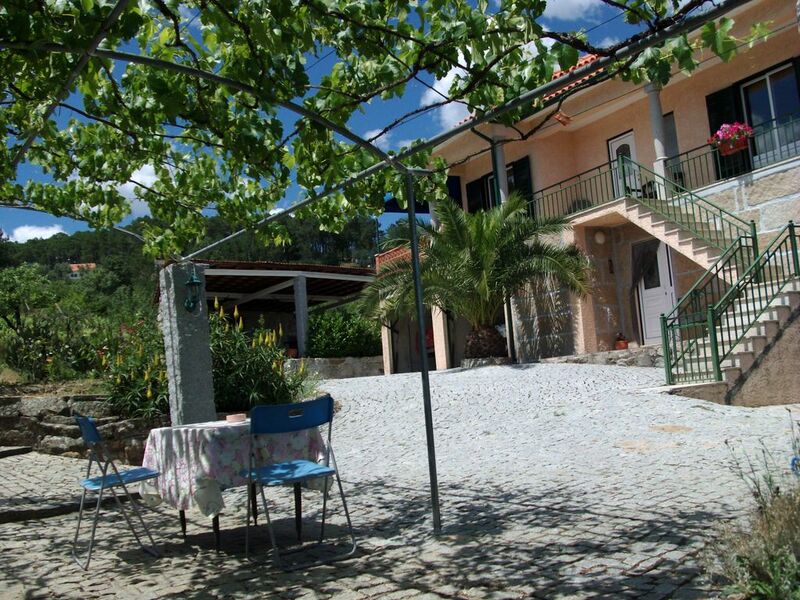 The Quinta is located close to Porto, Viseu, Guarda, Serra da Estrela, and Ciudad Rodriguez. The house was very clean and fully equipped with everything we needed to be comfortable. Maria and Peter are excellent hosts, very attentive and respectful. We felt like home and we will definitely return. Thank you, Maria, and Peter for your hospitality and generosity!!! And thank you so much for choosing our Quinta. We spent two weeks at Quinta do Mineiro . Peter & Maria are exceptional hosts and world class chef’s. They also have a very friendly dog named Heidi who is always there to greet you.This area of Portugal is filled with very old stone villages and numerous historical sites to visit. Many of these villages have festivals and small markets. Visitors are welcome to roam the numerous trails and back roads in the area. Peter and Maria have a beautifully maintained farm that produces delicious red and white wines and high quality olive oil. Everything produced on the farm is organic. The holiday house features tile floors and a granite stairway. It has a nice fireplace that heats a small boiler of water that circulates through out the house for cooler evenings. The kitchen has a stainless steel sink and a small dishwasher. There is abundant supply of dishes, cooking pans and other utensils. The house has a outside deck with comfortable furniture and great views. A recently completed stone BBQ will allow visitors to cook and eat meals outside. It even has a roof in case of rain. The house is beautiful, but what impressed me more was Peter's cooking. He is really a master chef, and treated our party to a superb 6-course meal which was served up in the open air in the courtyard. Having a gazebo overhead helped with the initial drops of rain, but once it developed into a full-blown thunderstorm - and a spectacular one at that - we had no choice but to decamp and move into the kitchen. Peter puts more than mere ingredients into his food - he imbues it with love for his guests and concern that they should have a gastronomic experience second to none. I will definitely make the effort to visit again - next time for a longer stay! Thank you Peter and Maria for a memorably sumptuous feast. My husband and I always want to discover different cultural practices when we visit a country. Our experience on the farm near Mantanca gave us insight into a traditional farm. Once we had navigated the narrow road to the gate, we were greeted by Peter who offered us a glass of his home made wine and took us on a tour of the house. What a wonderful surprise to find such a comfortably appointed. modern and well equipped home. The spacious two story accommodation is as depicted in the photos and described under amenities. The surrounding views are spectacular. Included are brochures and books to assist with planning excursions. Peter and Maria are gracious, attentive hosts who are very knowledgable about this part of the country. Maria was born on the land. We enjoyed walking into the villages that are close by and touring the scenic Estrela. This region of Portugal is rugged as one would expect with hilly, rocky terrain. There are many options available nearby to keep a visitor busy. Before we left, I purchased olive oil made from olives grown on the farm and had the opportunity to buy freshly baked bread that is delivered to the farm on Wednesday. I would highly recommend this traditional farm experience as a way to discover the real Portugal. Matança is a picturesque, original farming village at the foot of the Serra da Estrela Natural Park. Only 10 minutes. away from the A25, you can spend your holidays on a traditional Quinta or stop off on the way to Lisbon or to the south. 1 hour drive to Aveiro to the beach, 20 min. in the beautiful mountain landscape of the Serra da Estrela. Summer and winter sports. Many archaeological sites, megalithic tombs, Celtic places of worship. 20 min. until Guarda and Viseu with their historic old towns. Holidays on the farm where Portugal is still really original. No industry, no traffic, many rare plants and animals, clean water, wild and romantic mountains. Center of the production of the famous sheep cheese of the Serra da Estrela. In the heart of the Dão wine-growing region, we also make Dão wine, olive oil and organic farming. Starting point for hikes, bike rides, or motocross etc.